A star with five points. 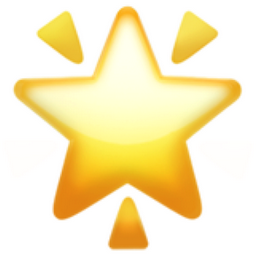 The classic star shape that is not associated with a religion. Used to mark good behavior, an excellent performance or praise merchandise. Ranking systems often use stars to show popularity. A five or six star ranking systems are the most common. The more stars something receives, the better! People sometimes say, "well, pin a star on you", which means you did something good or took an extra step - beware, however, snarky people often use this saying in a sarcastic way when they want to appear unimpressed. A star with five points is easily hand drawn without lifting a pen or pencil from the paper. 5 pointed star with mystical and magical essence. Perfection. Womp. Sparkles, yellow triangles (that's the glowing, pulsating part) were added to this star and without a doubt we have grown to love them. In iOS 5 this image was updated. The old star is now called "White Medium Star" and is still accessible today!